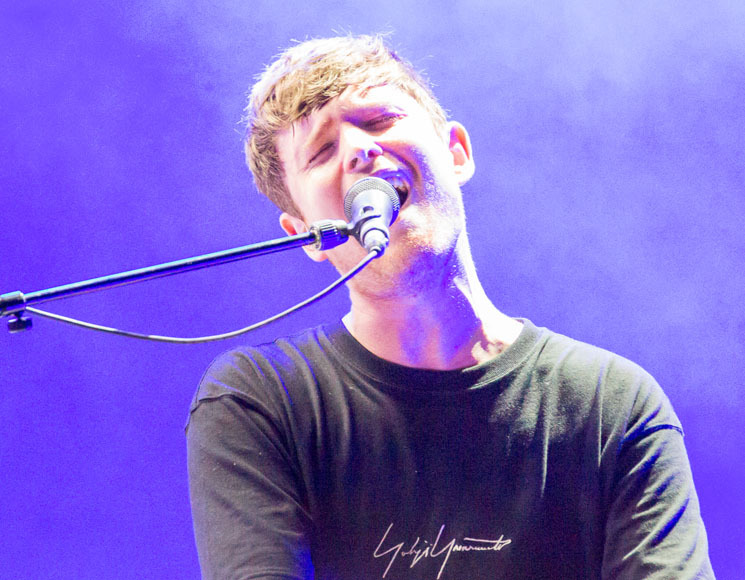 While much of the Osheaga crowd stampeded to the main stage for Travis Scott's headlining set, James Blake played the green stage and gave one of the most stunning performances that the festival has ever and will probably ever see. Emerging from the smoke underneath deep blue lights, Blake sat down at his keyboard setup, stage left, and launched into "Life Round Here," from 2013's Overgrown, to screams from the crowd. With an accompanying drummer and guitarist/multi-instrumentalist at his side, Blake transformed the tail-end of the track into an electric club anthem, demonstrating his talent not only as a singer and pianist, but as a rousing producer. As the song quieted down, he thanked the crowd for being there, stating coyly, "we know you have other options." Moving into "Timeless" off of 2016's The Colour in Anything, which sent the entire crowd swaying and jumping about, Blake hit a technical road bump during the start of "Limit to Your Love," telling the technicians that he couldn't hear one of the pedals, apologizing politely again. After a short tuning session "Limit to Your Love" resumed with the audience singing along. Followed by "Love Me in Whatever Way," the band then moved into "I Miss You" — announcing that it was the first they had ever played the song live. Throughout the set, flies buzzed around the spotlights, Blake joking that he was in the plague — a fly went into his mouth before the start of a song. While these funny little mishaps can sometimes hinder a set, derailing a sense of momentum, it allowed the audience to see a different, more playful side of Blake and his band between melancholic ballads and soaring vocal arrangements. Playing "Wilhelm Scream," which he announced was written by his father, and ending with "A Case of You," Blake put his hand to his heart and thanked the audience for their patience, complimenting the crowd before quietly leaving the stage.